Known for dazzling talent and spirited performances, Ivonne Hernandez is a bright spark in the fascinating world of fiddle music. At 36, Ivonne Hernandez has already had a lifetime’s worth of performing experience, yet it seems she’s only now tapping into her great potential as a fiddler. The native Victorian is five-time North American Fiddle Champion, a Juno winner, teacher, performer, experimentalist, really great stepdancer, and one-time child prodigy (we’ll get to that in a minute). While she doesn’t have David Foster’s mainstream appeal, Hernandez is one of Victoria’s most acclaimed musicians. It’s just that her folk/roots niche doesn’t carry the commercial clout of pop so she remains, outside her professional circle, a bit of a well-kept secret. Such is the lot of a one-time child prodigy whose remarkable skill, fiddle tucked under chin, hasn’t diminished since she first bowed a tiny version of the instrument at age three. “It was about the size of a Christmas tree decoration,” Hernandez recalls, revealing her first stage was underneath a hanging fern in the corner of the living room of the Westshore duplex she grew up in. The music her parents were listening to filled the room: folk, classical and traditional South American tunes. Dad grew up in Chile but fled during the military coup of the 1970s. He was playing in a Latin band when he met Ivonne’s mother — his band was hired by her for a Spanish Club party at McMaster University. When she was five, Hernandez spied a poster for a fiddle contest at the Saanich Fair. A neighbour from Cape Breton loaned them a Don Messer tape, and that was it. 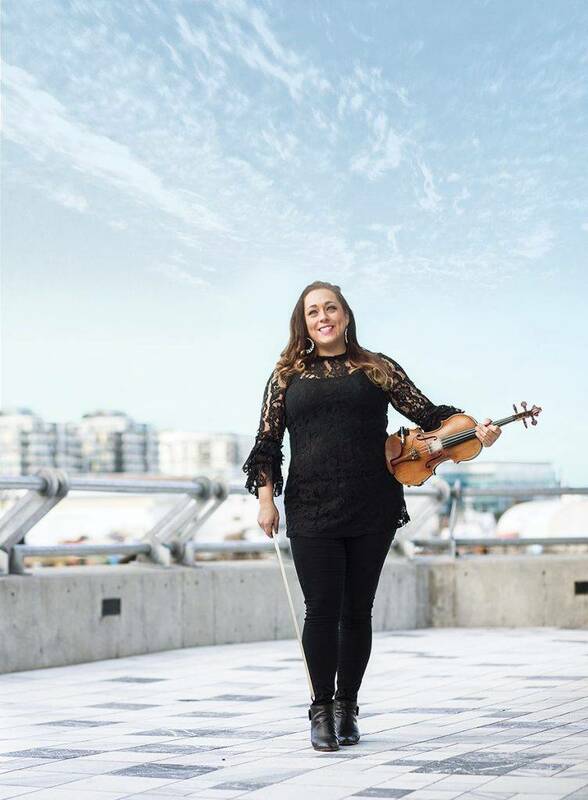 As a pre-teen, Hernandez played with Daniel Lapp’s BC Fiddle Orchestra (BCFO) in front of 60,000 people at the opening ceremonies of Victoria’s Commonwealth Games. At 13, she was the youngest member of the Greater Victoria Youth Orchestra and formed the band Fiddlemania with her younger sister Kalissa (who now plays with Vancouver band The Paperboys). She was the Merritt Old Time Fiddlers’ provincial champion two years running and was asked to start judging the event at 15. Topping it off are 11 of her own albums (solo and with bands she’s started), her work as a session player on a couple of dozen more by other artists, and gigs with artists as diverse as U2’s The Edge, Steve Winwood, Earth, Wind and Fire, Alan Jackson and even Burt Bacharach. Lapp talks about Hernandez’ discipline, motivation and ambition. She stayed with them for five years and three albums before leaving Boston to return home to … well, start another group. This time, Coastline, a string ensemble (fiddles, cellos, guitars, piano) of 14 to 23-year-olds who, like Dan Lapp’s BCFO, is the entry point for the super talented. Lapp says he’s really proud of her and her mentorship and teaching. Now working on a new album of her own material while exploring new forms, like bluegrass and jazz, Hernandez has put together Victoria Trad Weekend, February 15 to 16, where she and Coastline will perform. It’s two days of concerts and workshops at Esquimalt United Church, featuring renowned guest fiddlers Calvin Vollrath, Shane Cook and Troy MacGillivray. And in a country where fiddling is part of the national fabric (so many of us grew up watching Don Messer and Al Cherney on The Tommy Hunter Show after Hockey Night in Canada), Hernandez and her music are part of the tapestry. This article is from the January/February 2019 issue of YAM.